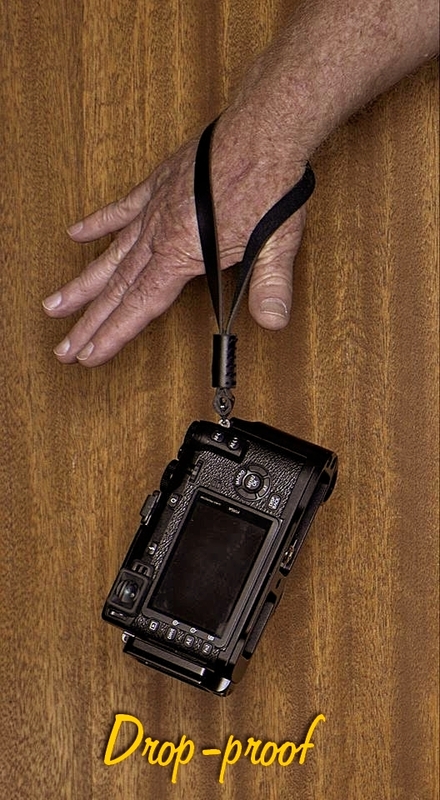 This is a method that I have been using a lot lately for holding my camera and taking photographs. I call it my “walking grip”. Photographs taken in this manner fall into the category of “no-finder shooting”, which is a term used by Daido Moriyama. You still compose the shot, but you don’t use any finder, and simply aim the camera by pointing it according to your estimation (or maybe intuition). You can do your image reviewing later, and slight framing and levelling anomalies can sometimes lead to giving an image a certain Je ne sais quoi. 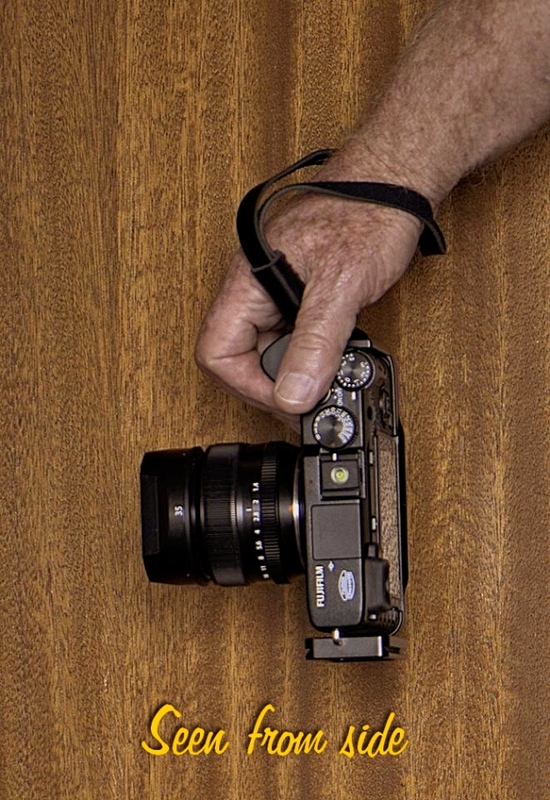 In my method, the camera has a leather wrist strap attached to its right-side eyelet, and is virtually un-drop-able. 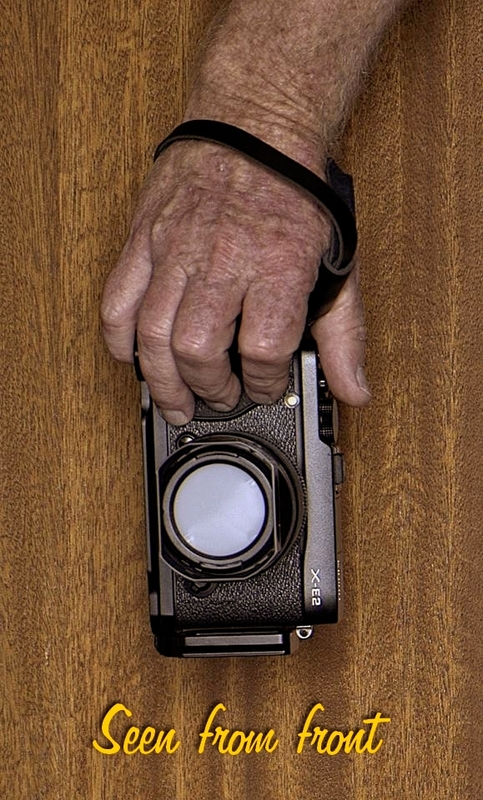 If the camera does not originally have a substantial enough grip, I add an after-market grip. And if the shutter release is threaded for a cable release, I also add a convex soft-release button. 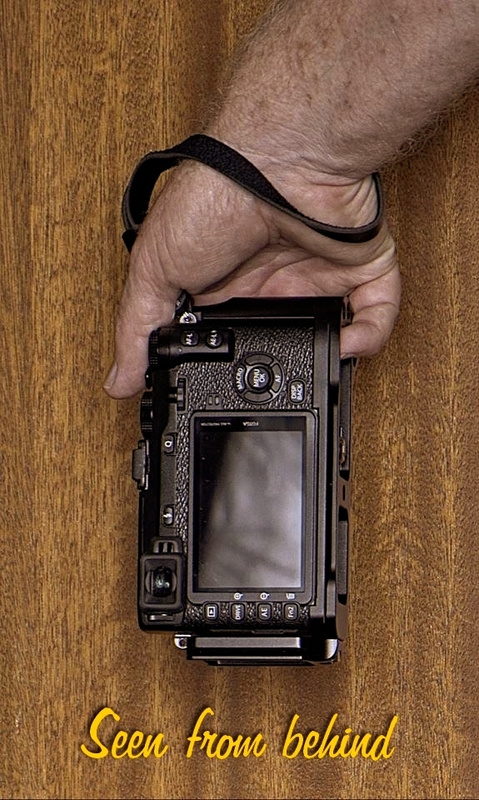 A distinctive feature of the way that I grip the camera is having my thumb (rather than my index finger) resting on the shutter release, and the grip is very loose. This method works well for compact cameras, and range-finder styled cameras. Not only is this a very comfortable and natural feeling way of holding the camera, but it also makes the camera naturally point forward when I am walking and shooting. In contrast, if I rest my index finger on the shutter release, I must either twist my wrist inward to shoot to the front, or else the camera is naturally pointing slightly to the side. If I am going somewhere in the city, I always like to have a camera with me, and I always like to have it ready to shoot. I walk with the camera turned on. I prefer a fixed focal length (prime) lens; say 35mm for an APSC sized sensor. Focusing is set to manual, and pre-focused to about 5 metres but with a moderately wide depth of field (so that anything from say 3 to 15 metres will be adequately focused). Aperture is set to F6 (to achieve this depth of field), and shutter speed to about 125th of a second. The ISO is set to auto, however, so that correct exposure is achieved by sensitivity adjustment. If your camera has a Mode dial (some cameras like the Fuji X-E2 don’t) then you would choose M mode with Auto ISO. If your camera doesn’t offer Auto ISO, then select A (aperture priority mode) and an appropriate ISO. When a scene catches my eye, all that I have to do is make sure that my camera arm is not swinging, and gently squeeze my thumb against the camera. This is a very comfortable way of carrying and shooting the camera, and you can maintain it for a long time without getting tired. Just remember to half-press the shutter button occasionally, to ensure that the camera does not go to sleep or auto-off. The images produced by this method also have several distinctive features. First, they are in a vertical format, since the camera is effectively being used sideways. And second, the camera is being shot virtually from knee height, so that the images can have an unusual and refreshing perspective. Some people consider that it is reminiscent of the perspective as seen by a small child. A third point about images shot in this style is that it captures people in a completely natural and candid disposition, since they are unlikely to suspect that the camera is operational when held in this way. If the camera has a fixed (non-interchangeable) lens, and therefor a leaf shutter, then not only is there no visible sign that the camera is being used, but there is no audible sign either (leaf shutters are for all practical purposes silent). If you like to shoot in an urban environment, and If you have a suitable camera, I recommend trying this method. I am mainly using this method with the Fujifilm X-E2 and X30 cameras. I should mention however, this method probably does not work so well with some DSLR cameras. They tend to be a bit heavier, and therefor more tiring to carry with a loose finger grip. And a larger and heavier lens at the front will tend to make the camera point a little downward, so that you will have to make an effort to keep the lens pointed level. (A pancake lens would mitigate this problem, however.) 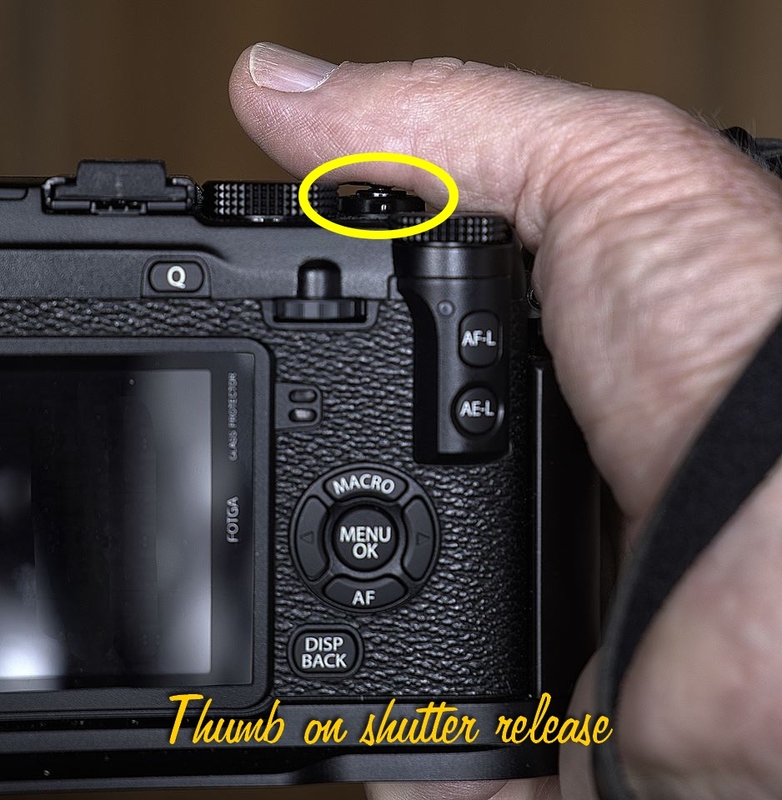 Also, many of the DSLRs have a shutter release button that is difficult to operate by your thumb. If you have a suitable camera, I hope you find the shot-ready walking grip a useful photographic technique.